Once upon a time, one of my nerdy friends convinced me to watch this Japanimation film called Spirited Away. To be honest, I've never been a big fan of the genre, but I figured it was better than doing actual work. Much to my surprise, I was completely taken by it! It's bizarre and beautiful, and I couldn't look away. 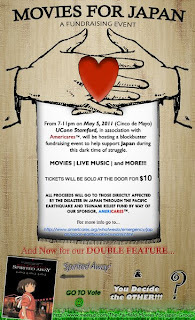 Take a look for yourself and help Japan recover by joining in for Movies for Japan. The event takes place on May 5th from 7-11pm at University of Connecticut-Stamford (1 University Pl). The charitable event will also feature live music and all proceeds (thanks to AMERICARES™) will support the Pacific Earthquake and Tsunami Fund. For more info, contact Jack O'Brien at 203-858-0720 or jackobrien@teacherarchive.org. Tickets will run you a very reasonable ten bucks.